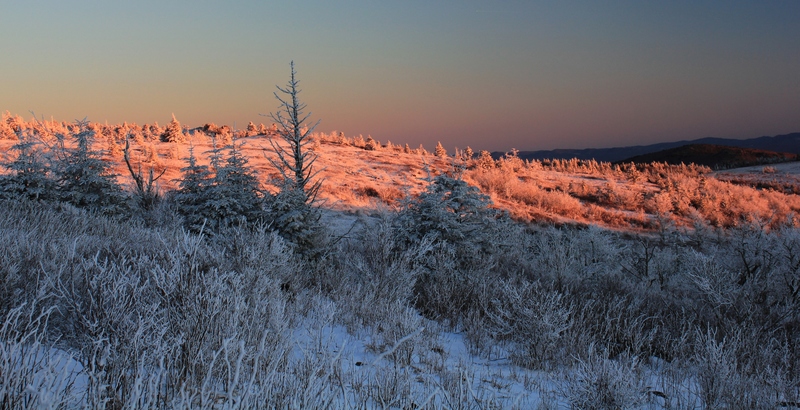 On Saturday, December 22, 2012 we went on a winter backpacking trip that was extremely cold but rewarded us with incredible conditions for photography: massive hoarfrost, remnants from a snowstorm, and true alpenglow lighting—a rare combination anywhere, but especially in the South. As the evening sun set, the entire sky in the east (the direction opposite from the sun) began to glow pink with a purplish band at the horizon. 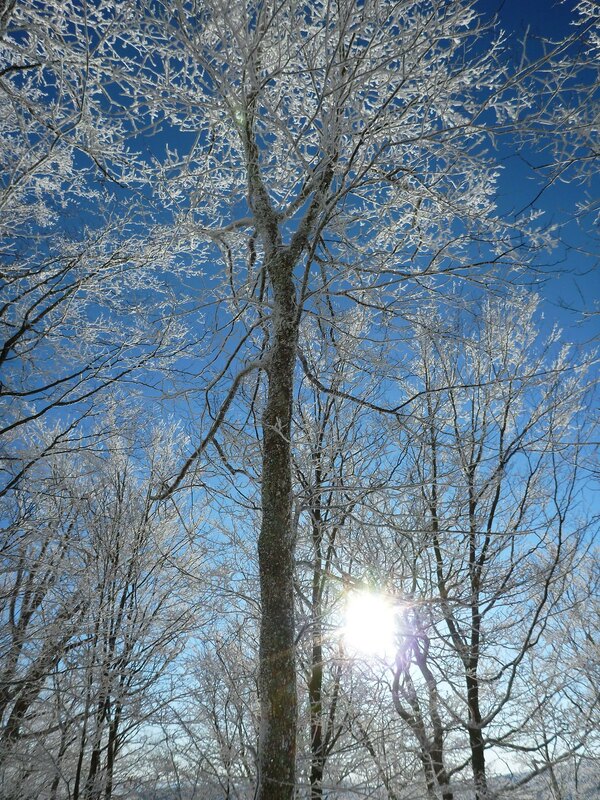 The rime-encrusted trees and brush, which had their own bluish-white hue, looked otherworldly. The side of the mountain basked in the alpenglow. In the course of my life I have seen this phenomenon on occasion in the Rockies and in the Alps, but never so pronounced in our region as it was this evening. For a comparison with the same phenomenon on the Matterhorn in Switzerland, see this photo. While the orange light from a sunset is itself beautiful, true alpenglow—when the entire sky is lit with light seemingly emanating from behind or even within the mountains, in the opposite direction from the sun—is amazing. Looking towards where the sun was setting revealed another interesting effect—purple mountains with an orange sky. As we continued to take pictures until almost all of the light was gone, we were reminded that part of the reason for the great conditions was the cold. And it was getting colder by the minute. Operating the cameras and standing still, the chill began to invade us. Toes and fingers burned. As the last good light disappeared, we continued onward to make camp somewhere near the top of the mountain. Our planned out-and-back route was straightforward: A one-day hike from the Elk Garden area of the Mount Rogers National Recreation Area up to the highest parts of the southern side of Mount Rogers near the famous Thomas Knob shelter; an overnight in the shelter or at a tent site somewhere in the vicinity; and a return back via the Appalachian Trail and the Virginia Highlands Horse Trail. 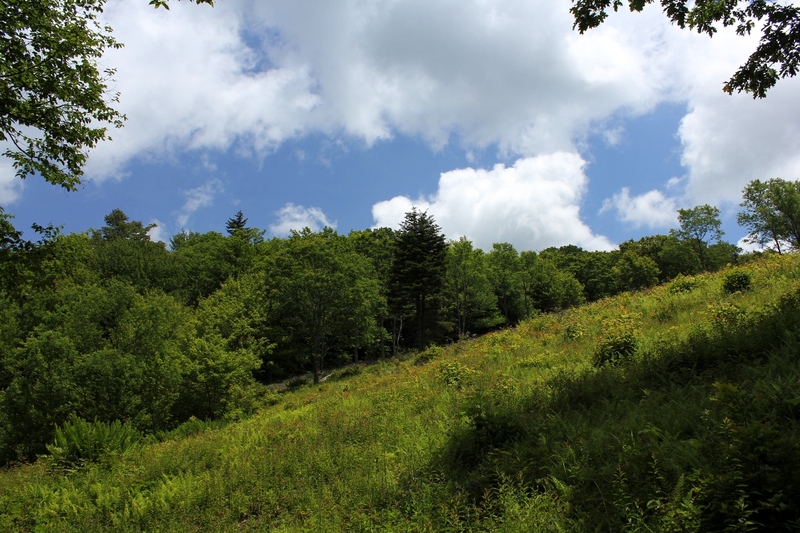 These trails roughly parallel the Grayson County-Smyth County line for about five miles along the mountain ridge. As we approached the mountain, you could clearly see the delineation where the frost began to accent the freshly fallen snow. While you could see the snow between the trees on the bottom half of the mountain, on the top half of the mountain everything—literally every single thing—was covered with brilliant white frost. 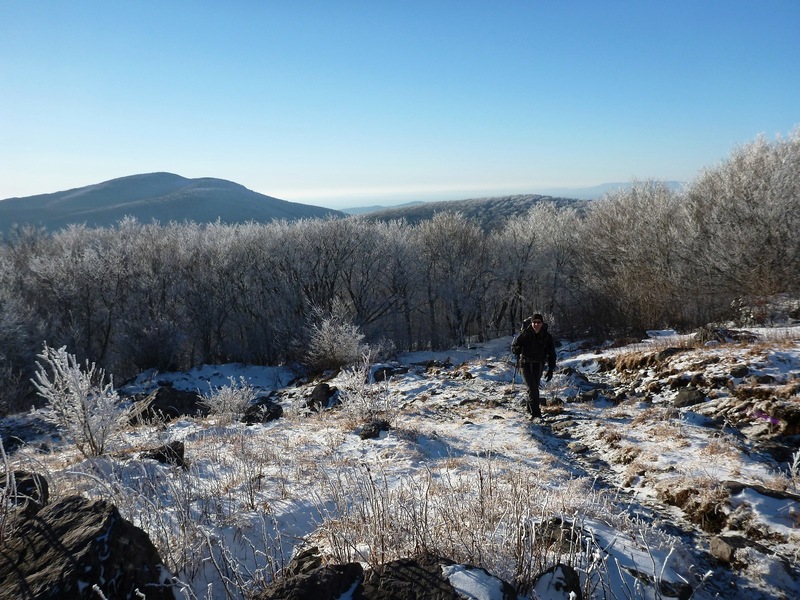 Donning my 44-pound backpack full of winter camping gear and camera equipment, I crossed the road and started up the Virginia Highlands Horse Trail. 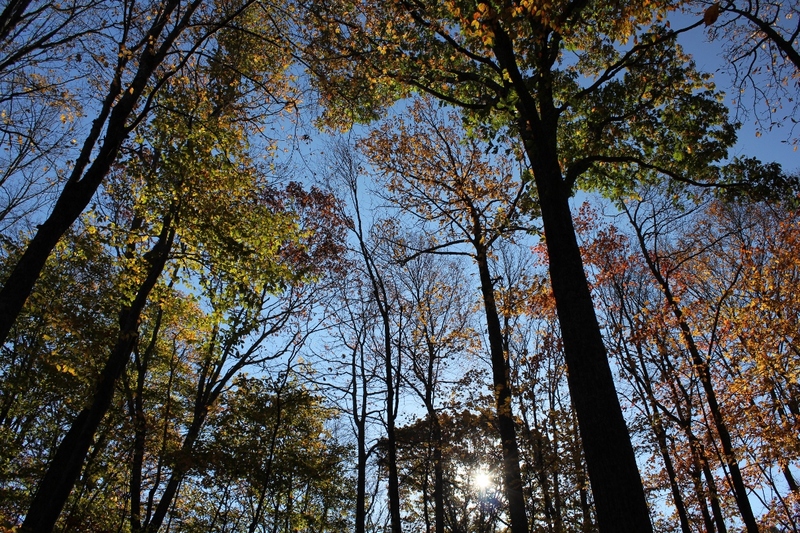 The hike started through trees, which glistened overhead. The skies were bright to the west, where the sun was already dropping, but were a dark cobalt blue in other directions. The frost coated everything. 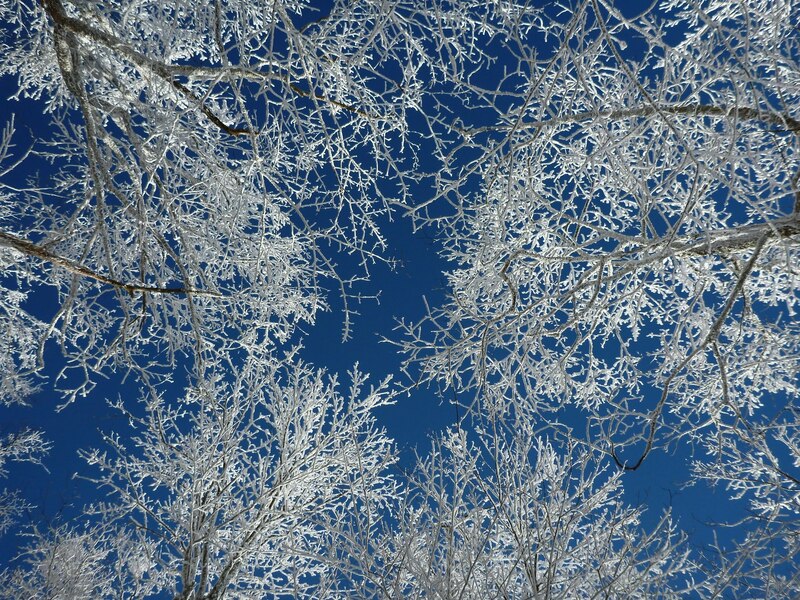 Tree branches were twice or more their size due to the hoarfrost. Once up in the balds, you could see great distances. 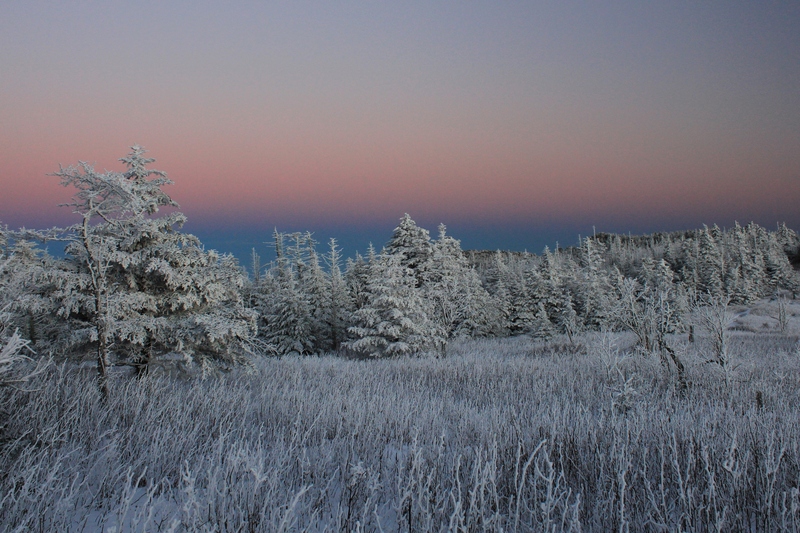 The mountains to the south had snow but little frost; to the north across the valley, Clinch Mountain had frost on its largest southern-exposed face, known as the Bear Town area. The contrast between blue and white was dramatic. 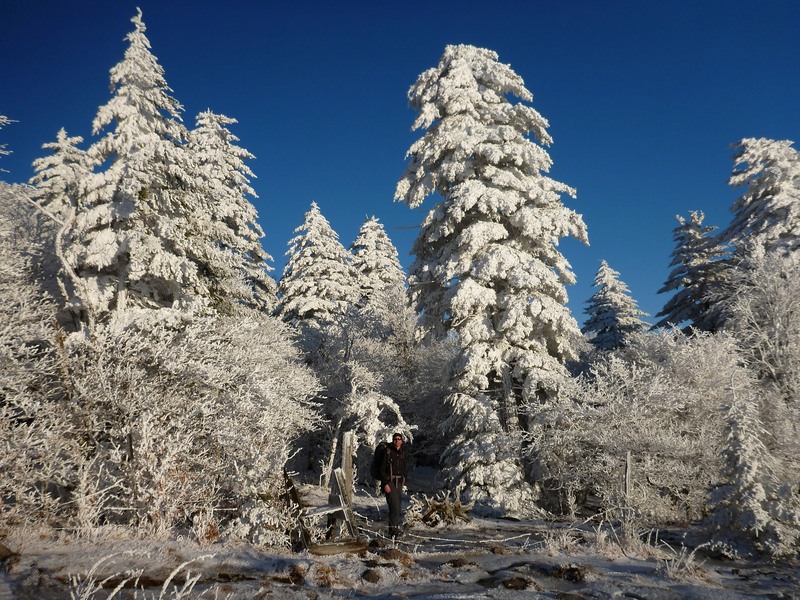 Hiking in this winter wonderland, you could easily imagine yourself in another part of the United States, or another part of the world, hiking in the Arctic or in true Alpine conditions. 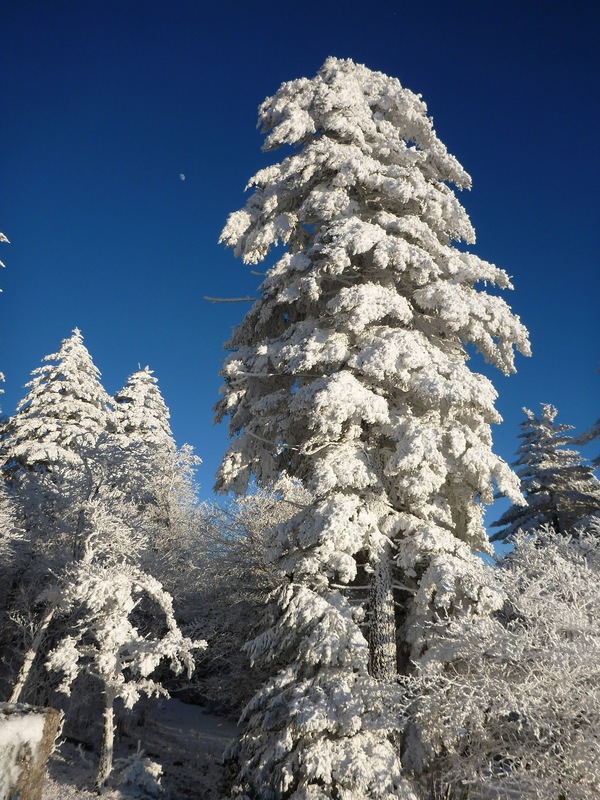 The Frasier firs and other trees at the highest elevations looked almost fake with their limbs and branches so heavily laden with frost. The moon rose dramatically in the East, signalling that this was the shortest day of the year, the winter solstice. The entire hike, as awesome as it was, was merely the opening act for the light show we were about to watch. As we rounded the first bend that allowed us a view to the eastern horizon, the whole mountain became aglow in amazing colors. The photos we took do not adequately show the overwhelming color of the scene. The periphery as well as the main view to the east were bursting with palettes of pink and purple. In the photo below, I used my camera’s panorama feature to show a 180 degree view. The entire episode of amazing light lasted less than one-half hour. Even the fading light was beautiful, as captured below. The sunlight disappeared, and the moonlight began to illuminate the mountain. It was not a full moon, but it was sufficient such that you could walk without a headlamp once your eyes adjusted. The light show over, we set out to make our camp. The temperature seemed to plummet by the minute. The winds, which were not insignificant while we were obsessed with photography, seemed to increase in strength and become more ominous. It was definitely getting colder. There would be a price to pay to for the incredible optic conditions: suffering through a brutal night of cold and wind. 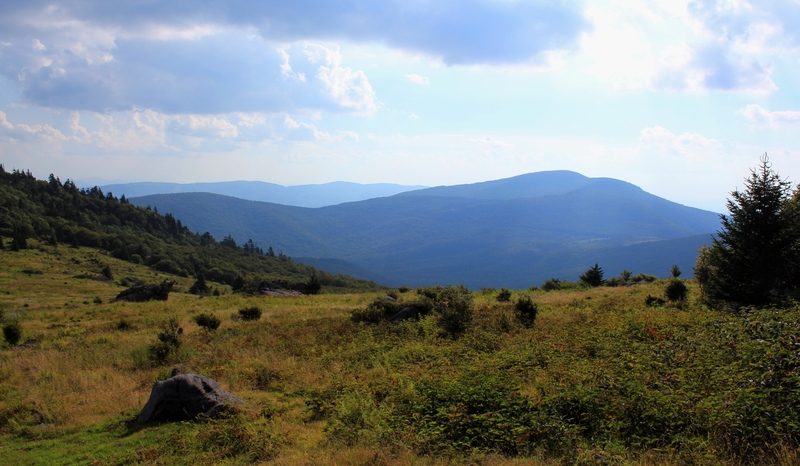 The next day, when we returned to our vehicle, an older gentleman walked into the parking lot from the other direction–coming down off of Whitetop Mountain. A large white beard, accompanied by a red union shirt, made the man appear as a slim Santa Clause coming from the snowy woods to inspect his winter kingdom. The man was none other than Damascus Dave, a well-known and experienced thru-hiker and outfitter in the region. We told him we had, and we began discussing the wind gusts and how cold it got last night. We talked about gear for a while, and how while we were prepared, it was still extremely cold. As I stood there in the parking lot, tired but satisfied, I realized that he spoke the truth. We weren’t cold while hiking. (In fact, while climbing it’s pretty easy to actually overheat.) We moderated our hike so that our pace kept us warm but didn’t cause us to overheat. But when we stopped, the whipping wind would quickly steal body heat. We had to put on our down jackets when we stopped. (You don’t want to overdress, risking sweating too much and the dreaded “wetting out” inside your jacket, but you have to dress sufficiently to keep warm.) It’s a balancing act to maintain warmth in these conditions. Preparation, proper clothing, and layering is key. 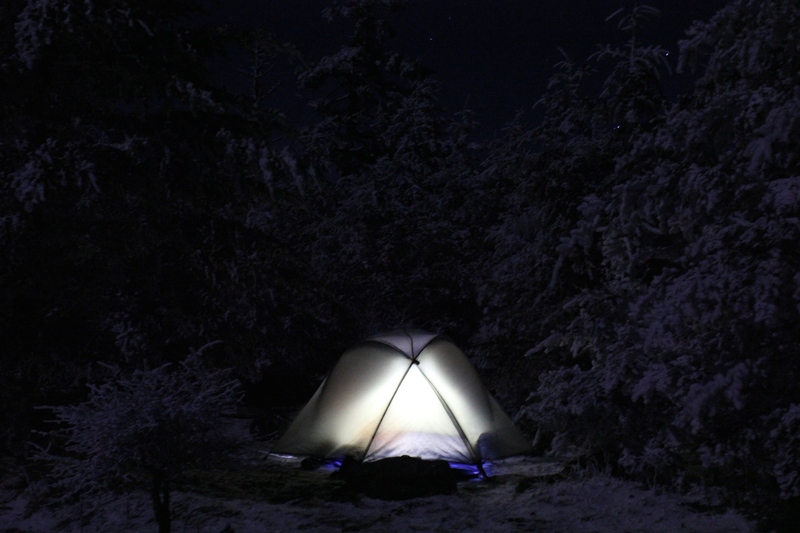 However, regardless of your dressing properly, setting up camp when it is really cold can be difficult. The cold seeps through your gloves, burning and then numbing your digits, making it increasingly difficult for you to manipulate them. For example, holding aluminum tent poles firmly while setting up a tent just saps the heat from your hands. Simple tasks require greater concentration and mental focus when it’s freezing and your hands are numb. Standing around while doing these kinds of tasks causes your feet to get cold, too. By the time we had set up our tent, the water in our one-liter water bottles had almost completely frozen. The sandwich I brought for dinner had frozen. And the gas canister that would allow us to warm up some water for coffee and oatmeal was not functional. 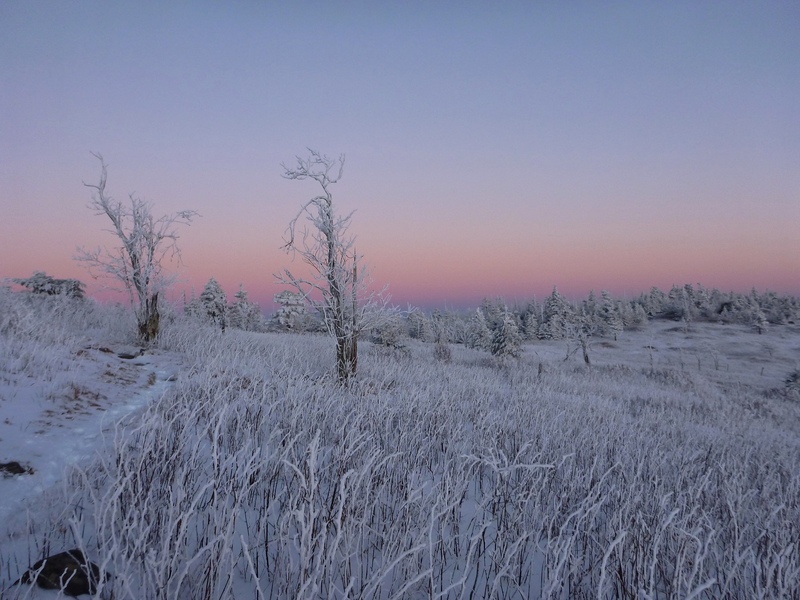 That night, I slept in my 15 degree-rated sleeping bag on a sleeping pad, with polar fleece pants, two undershirts, a fleece jacket, wearing a down jacket, a hat, and gloves. My feet were covered with wool socks and insulated slippers. And yet, my feet and hands were still cold. My friend, who brought his 0 degree-rated “Never Summer” down sleeping bag, fared no better. Let’s just say, it was very cold. We warmed our water by placing it in our sleeping bags, along with a host of other gear that was generally uncomfortable to have there: batteries from my camera; my headlamp; additional food; the gas canister; and various other items. The wind was blowing interminably, with gusts that seemed Everest-like. In putting up our tent, we staked through the first inch of frozen ground down into the soft earth, and used some additional rocks to keep if from moving. Nonetheless, the tent flapped incessantly through the night, and the intermittent gusts seemed to have enough force to blow us off the mountain. Exposed winter campsite at 5400 feet. Brrr! If you click and enlarge this photo, you can see the stars visible between the trees. Despite the good weather window reported on the news and on the Internet the previous day, the temperatures plunged and the wind whipped with increasing intensity through the night. Using the heat inside our sleeping bags, we were able to thaw the iced-through water bottles. Little did we know that although the weather was predicted to improve at the lower elevations, the recorded temperature (single digits) and wind chill (below zero) was the coldest in December 2012, and wind gusts were recorded at 65 miles per hour at the Grayson Highlands State Park Weather Station, almost 1500 vertical feet below where we were camping on the exposed ridge at over 5400′. 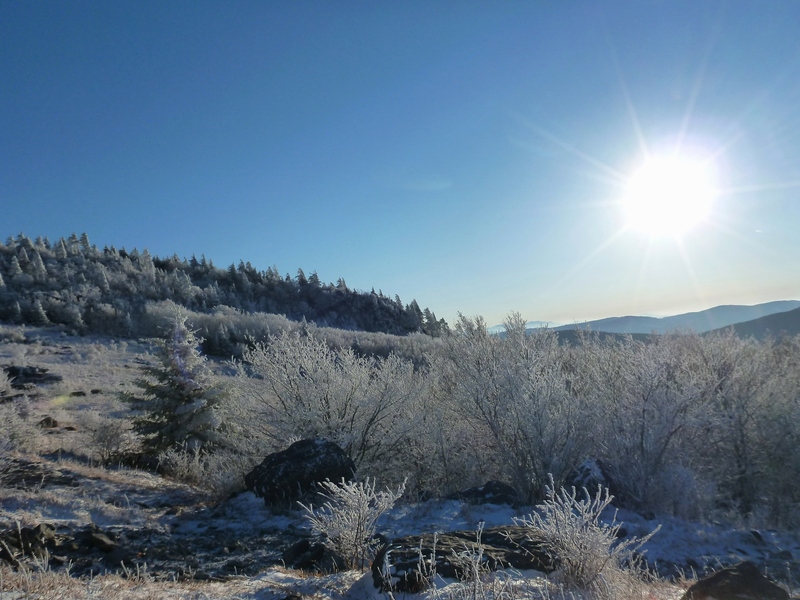 December 2012 Weather Graphs for Grayson Highlands State Park. 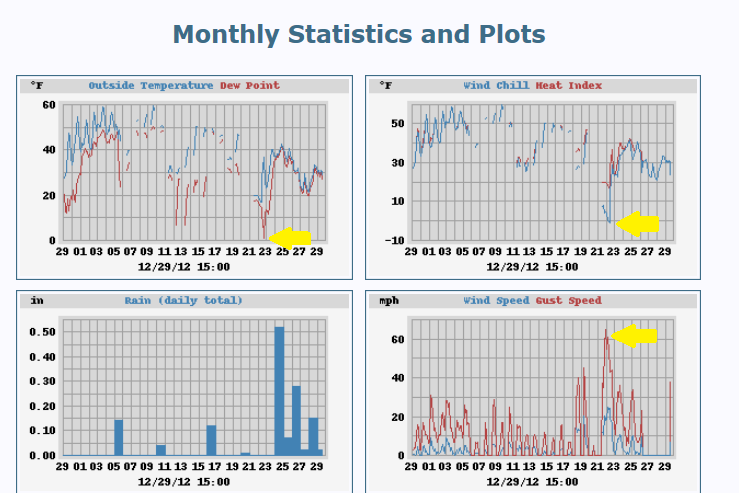 Note the yellow arrows showing December 22, 2012 statistics: Single digit temps and 65+ mph wind gusts. This weather station is 1500′ below the campsite in this article. If we had not been adequately prepared that evening, an uncomfortable night could have been much worse. Instead, we awoke the next morning, broke camp, and went back to the Thomas Knob shelter to brew some coffee to warm up before the hike back to the trailhead. As expected, as we hiked back down the mountain, it got warmer and the winds subsided. By the time we returned to the parking lot, it was comfortable enough wearing just our fleece sweaters to stand around and chat with Dave regarding harrowing experiences he had heard about in this area. (Many folks have actually been in some real danger up on the mountain). While not uniquely cold, the weather we had experienced was extreme, especially for this region. For us part-time adventurers, you might even call the weather conditions epic. 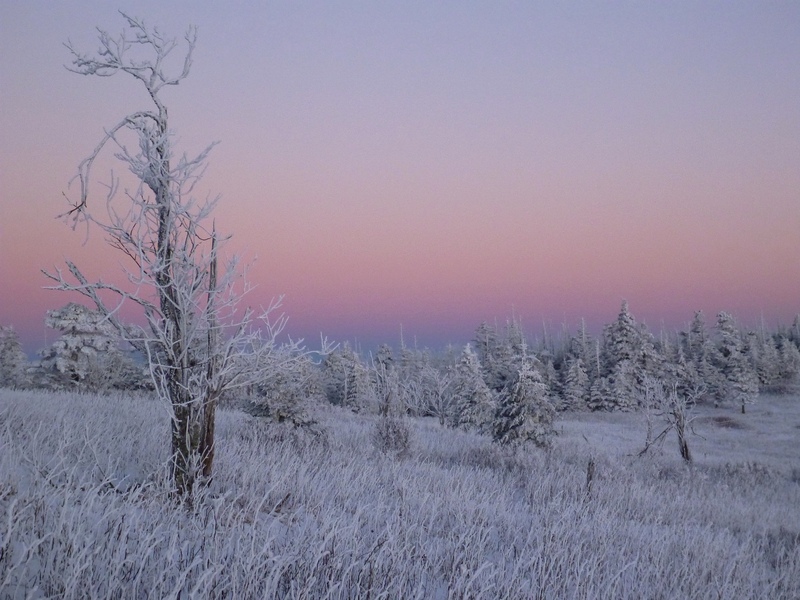 The evening sunlight, true alpenglow, and whole experience made this a fitting winter solstice backpacking trip, a perfect prelude for Christmas and the New Year. The suffering part? Yes, it was definitely worth it. Meaningful achievement, even something as relatively inconsequential as a winter overnighter, requires some striving and involves a little or more discomfort. It’s in part the difficulty that makes it rewarding. If it were easy, everyone would be doing it, and the solitude sought after in these kinds of trips would not exist. And for the record, yes, I actually did carry with me and wear insulated slippers. Big Sky Country . . . in Virginia! 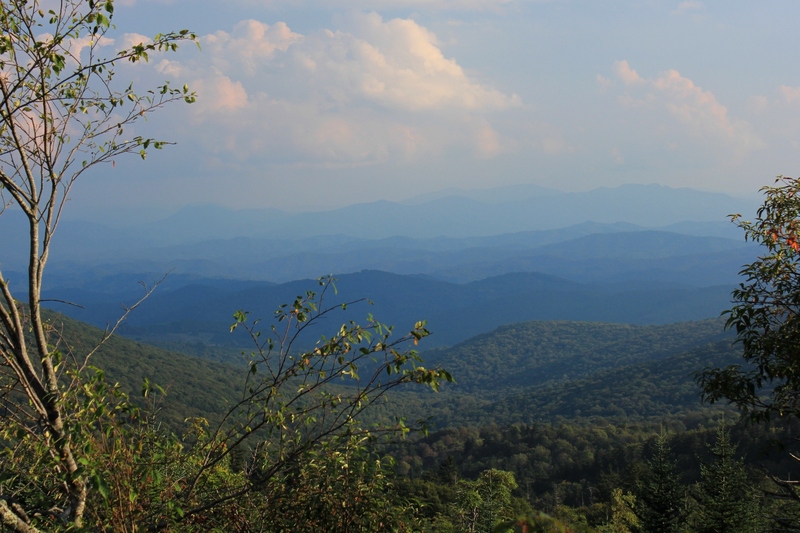 High up on Pine Mountain in the Mount Rogers National Recreation Area is an area known as the Scales. This June we drove and hiked up to this area. Basically, it’s nothing more than a grassy, fenced in area used by campers and horse riders. On the other hand, the Scales have been for many, many years the eastern gateway to the high country of Mount Rogers, where ranchers brought their cattle to graze in the summer and then sell during earlier in the 1900s. Livestock was weighed up here (thus the name “Scales”) before the animals trekked back down off the mountain and lost weight (and brought their owners less money when sold). The Scales are located above 5000′. The Appalachian Trail crosses right above this area. 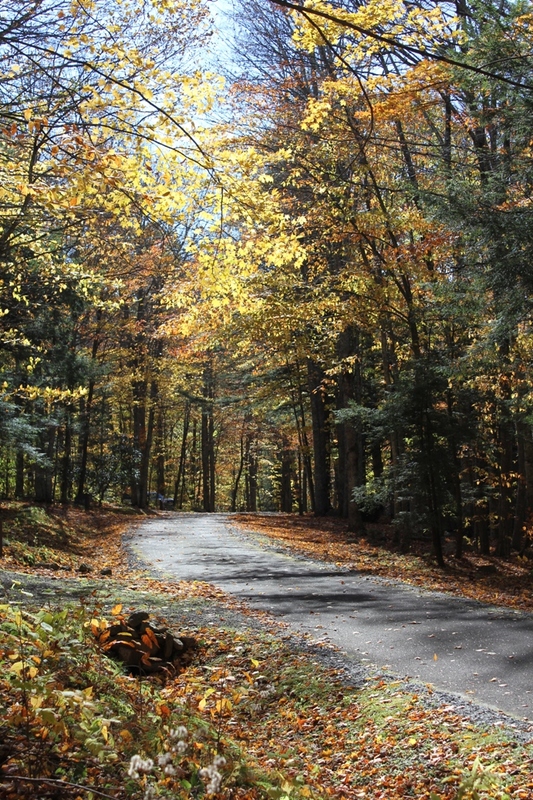 The most direct route from below is Route 613, which is a rugged, rock strewn forest road that requires a high clearance vehicle. The road eventually crosses a cattle guard. 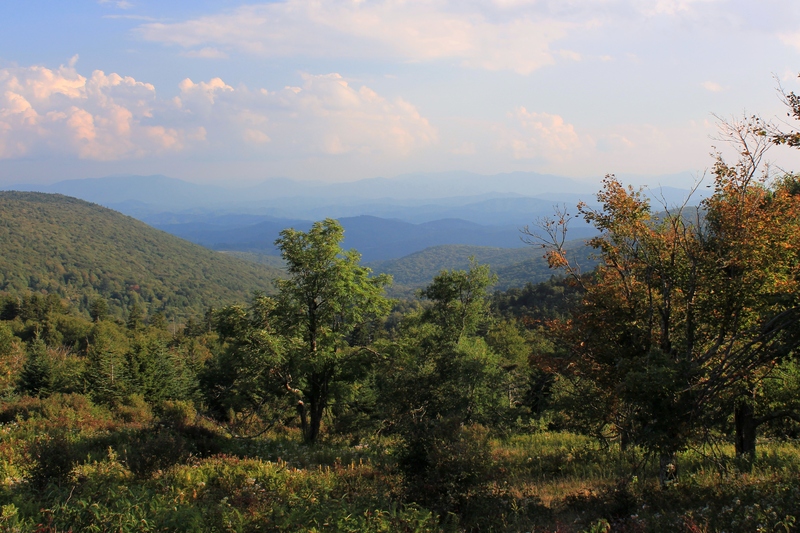 Shortly thereafter the forest opens up to show Pine Mountain and some good views to the north of the valley and ridge mountains in Virginia. The skies always seem to be a deeper color of blue up here on the mountain. The photo below shows the numerous mountains visible to the north from the area near the Scales. 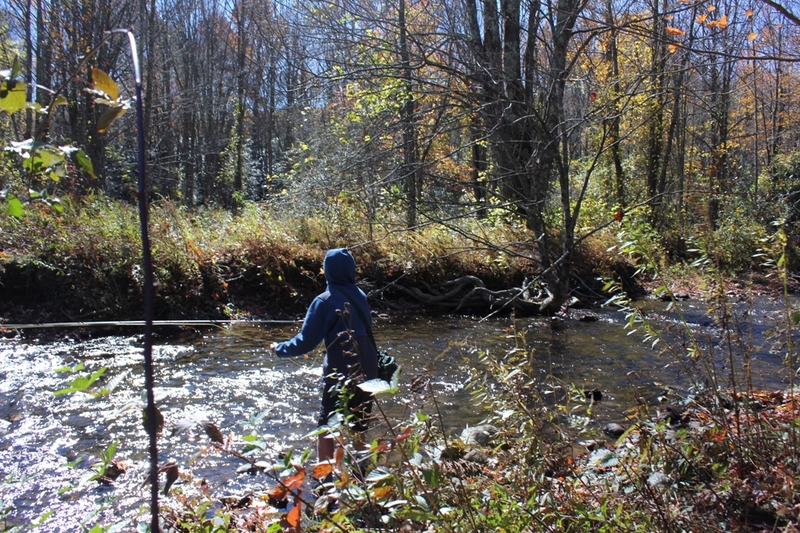 In my last fishing essay, I described solitary fishing in winter on small streams. In that article I referenced a book published in 1938 that my mother gave last year me titled Upstream and Down by Howard T. Walden II. Mr. Walden’s book descriptions are as appropriate today as they were in the 1930s. His commentary shows an amazing prescience about many matters related to the outdoors in general and fly fishing in particular. 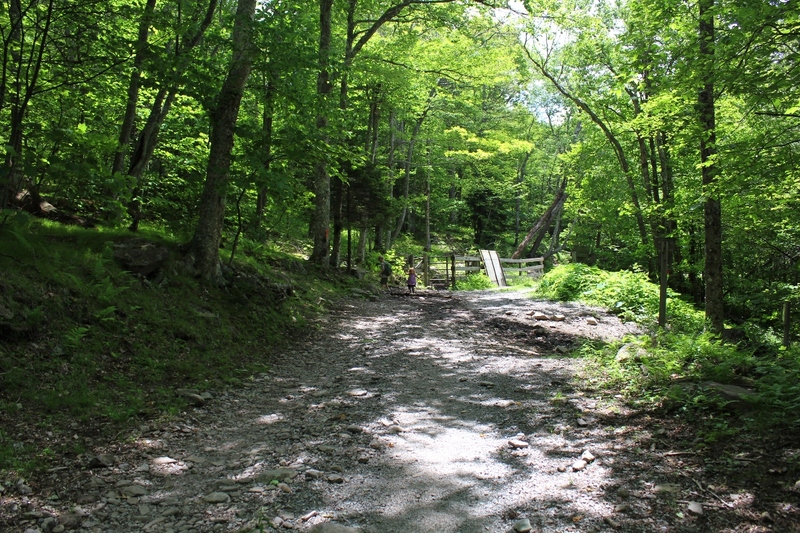 One of the themes of Mr. Walden is that in the 1920s and 1930s the small streams of the East were becoming more accessible, and that there were fewer and fewer secret streams left anymore. Some trout streams are important for their trout, almost all for their beauty, a few for their associations and memories. In the last category are the secret streams of the past. Every angler who has been at his sport a score of years or more can remember whispered directions, the pledges of secrecy, the long and tortuous journeys to those segments of Paradise hidden in the back country. Such prospecting and discovery once constituted the most glamorous aspect of trout fishing. But that is gone in the world, now, except in the remote semi-wilderness counties. Most young anglers, casting over their first pools in the nineteen forties [1940s], will not know the high adventure of finding a secret stream. The automobile has accomplished this special destruction along with general spoliation of virgin countrysides. The motoring hordes have found all the streams there are. . . . The State has charted all the likely water, filled it with foreign trout and invited the public to come and get ’em. And the public comes. Paths have been beaten by many booted feet along both banks of the farm boy’s secret brook and the wild shy native beauties of that little watercourse are disappearing, dying in the hostile company of rainbows and browns. Upstream and Down, at 170-171 (1938). Mr. Walden was generally speaking about streams in the Northeast, in New Jersey and Connecticut. Many of his prognostications, however, are equally applicable in Virginia and throughout the Southeast. 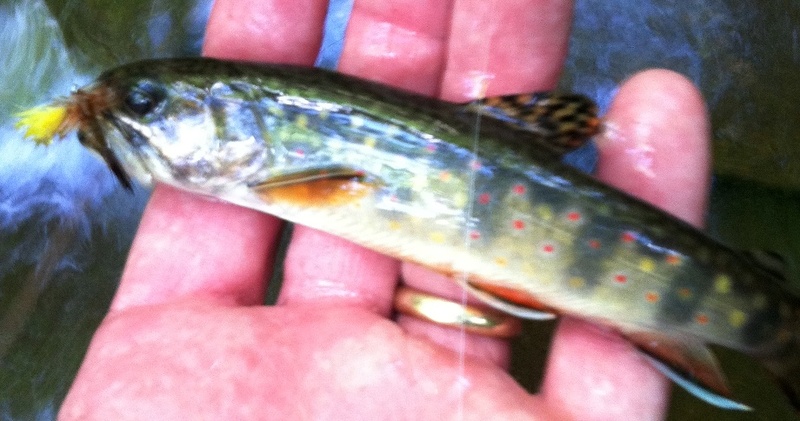 A little brook trout, the official state fish of Virginia (and of West Virginia), caught in June 2012. Note the parr marks (vertical stripes) on this fish. 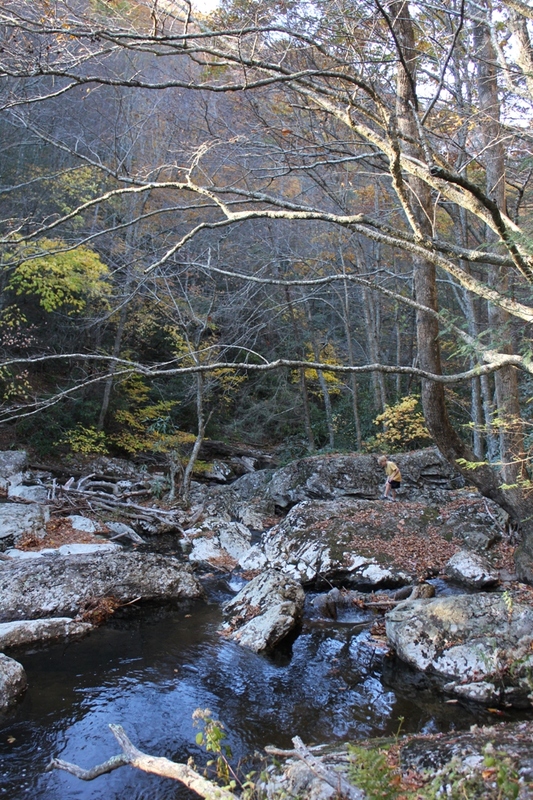 In the most rural sections of Southwest Virginia, there are still secret pools (if not completely secret streams) holding the same native brookies that have lived here for a thousand years. 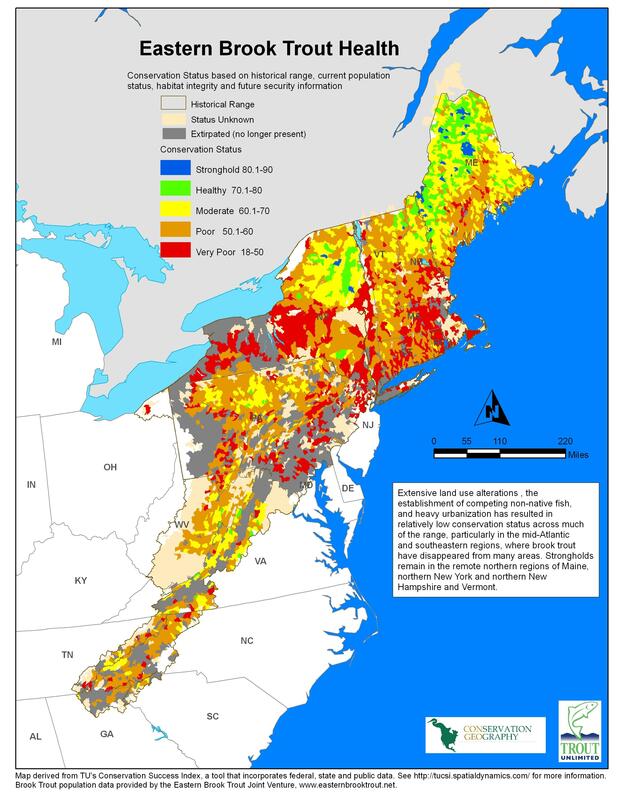 While our brook trout are no doubt still under pressure, as the map below (and this even more detailed Virginia map) shows, there is good news lately about brookies in Virginia. 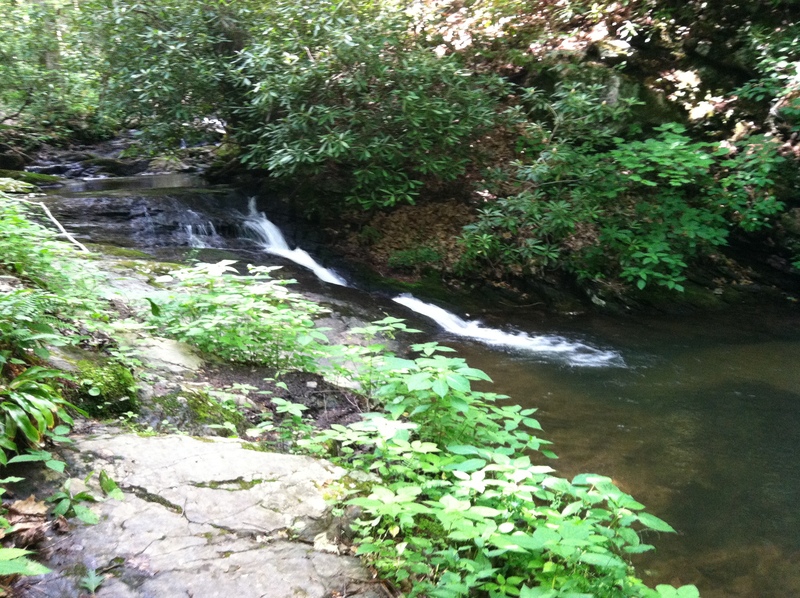 In the Summer 2012 issue of Trout, Trout Unlimited’s “Journal of Coldwater Fisheries Conservation,” there is an article indicating that Virginia brook trout streams are healthier than they have been in decades. One of the main fisheries referenced is St. Mary’s River in Augusta County (which I visited and wrote about last year, here). 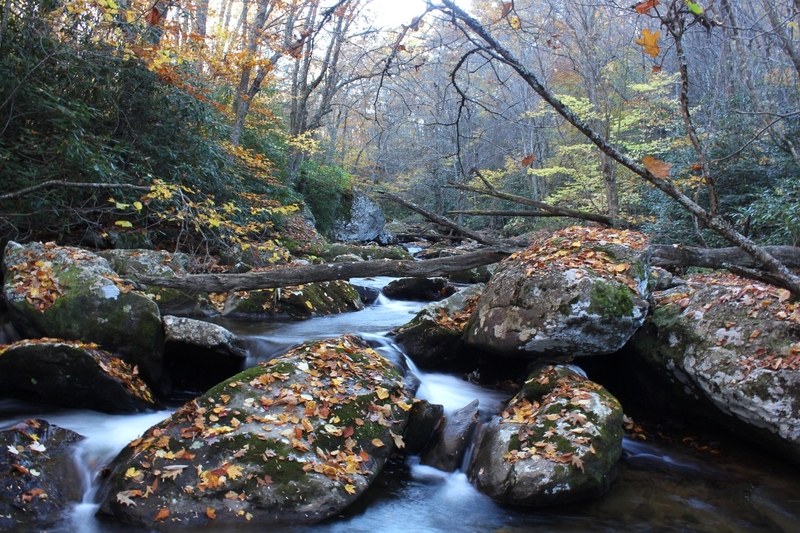 According to the article, acid rain deposits, which negatively affect stream quality, have decreased 18 percent between 1987 and 2010, and “acid neutralizing capacity” of the Virginia streams studied have increased 82 percent during this same period. My own anecdotal experience is consistent with Mr. Walden’s observations 80 years ago: Much of the pressure that can be expected to continue on our native trout streams will still come from the “motoring hordes,” especially those individuals who trample on these treasured resources, leaving their garbage behind while taking their full bag limit (or more) of trout, which can quickly eviscerate these sensitive fisheries. On one point, however, I must disagree with the esteemed Mr. Walden. 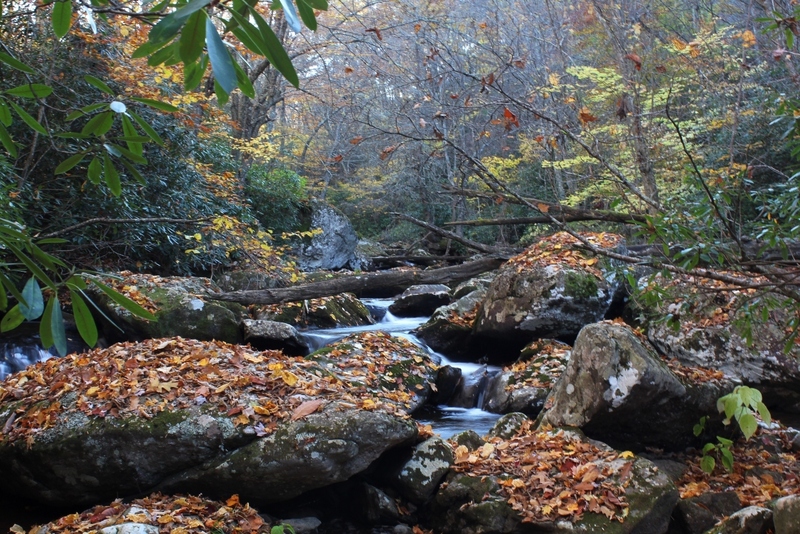 While we may no longer be able to readily find entire secret streams unknown to most of mankind, there is still much “high adventure” to be had in our mountain streams (and beyond). We just may have to search a little harder these days for a secret pool and be willing to enjoy the more modest adventure of rediscovery of off-the-beaten-track places that are still, after all these years, quite beautiful. In the future we will continue to know streams most important for their associations and memories, recalling those days of yore when we found that secret pool, or caught that lunker fish, or shared that special trip with a relative or friend, as glamorous in our recollection as were those memories of the fishermen of the past. Because those nostalgic fishing memories—just like the proverbial fish story itself—always seem to grow, and never diminish, with time. 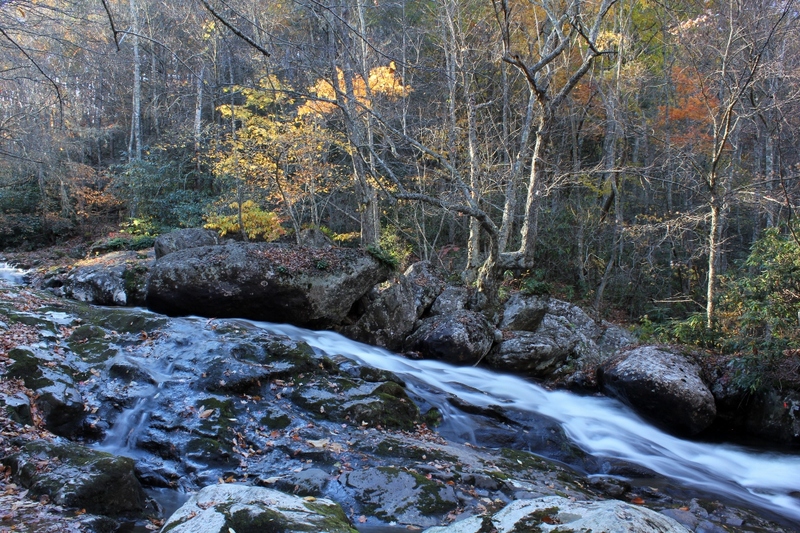 One of the gems of the Mount Rogers National Recreation Area is Fox Creek. 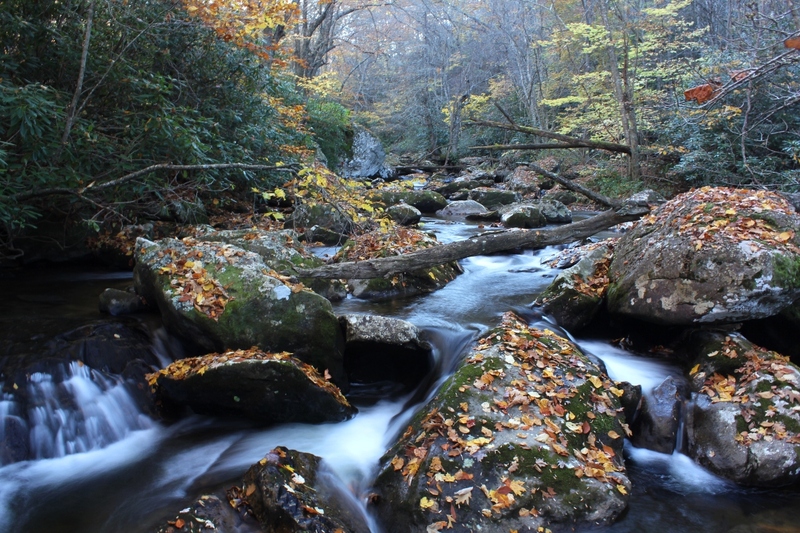 Nestled between the south side of Iron Mountain and the north side of Mount Rogers, Fox Creek flows east through about 5 miles of National Forest before entering private property down the mountainside. The two trips we took to Fox Creek in October revealed remarkable foilage on the moss-covered boulders. Although past their peak vibrancy, the leaves created a tapestry of color that I needed to capture with the camera. The first day we arrived in the middle of the afternoon. The sunlight was too harsh for good photography, so we came back the next day in the later afternoon. The boulders in the creek are quite large; in the photo below, you can see my son Isaac playing on one of them. The upper part of Fox Creek is formed when Lewis Fork Branch joins the Fox Creek headwater. At this point, the creek becomes a full fledged, albeit small, trout stream. 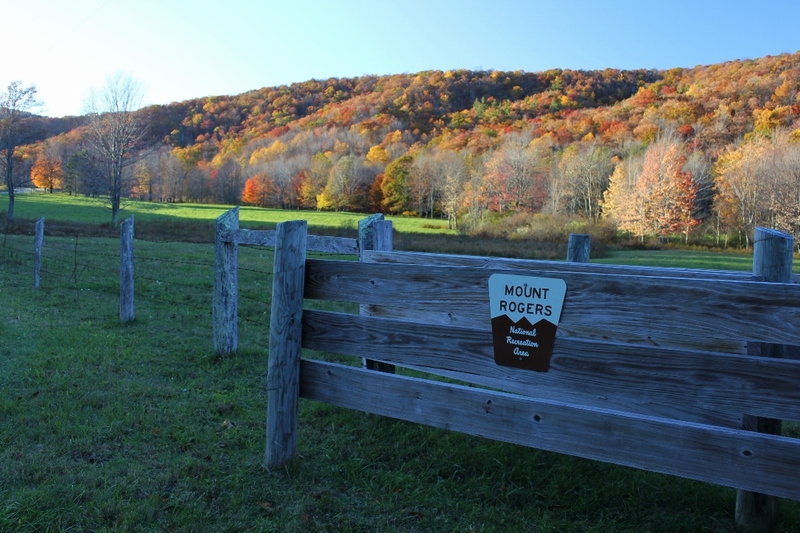 A modest, high elevation valley forms between Mount Rogers and Iron Mountain. 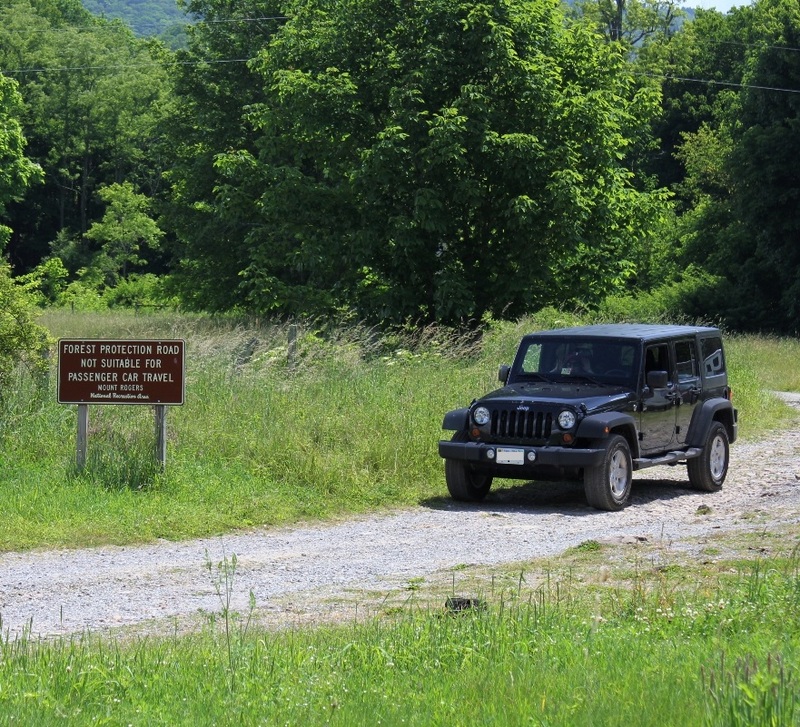 The National Recreation Area has a large, split rail fence that runs along Virginia Route 603 for several miles. 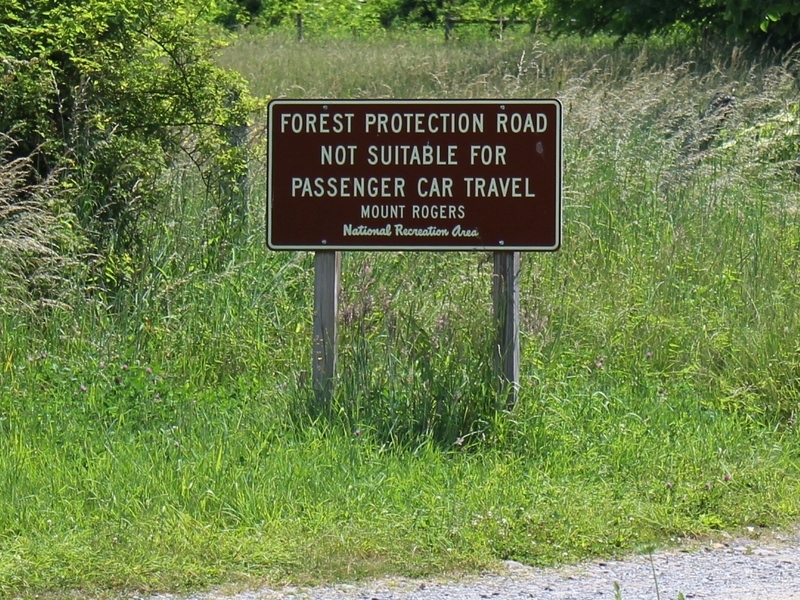 Along this section of road is the trailhead for the Mount Rogers Trail, Grindstone Campground, a parking lot for the Appalachian Trail, the Fairwood Horse Camping Area, and the entrance to the unimproved road that goes up to the Scales area of Pine Mountain. Fox Creek in this area is a small, swiftly moving creek with a gentle gradient remiscent of a Midwestern trout stream or an Eastern chalk stream as much as typical freestone stream. 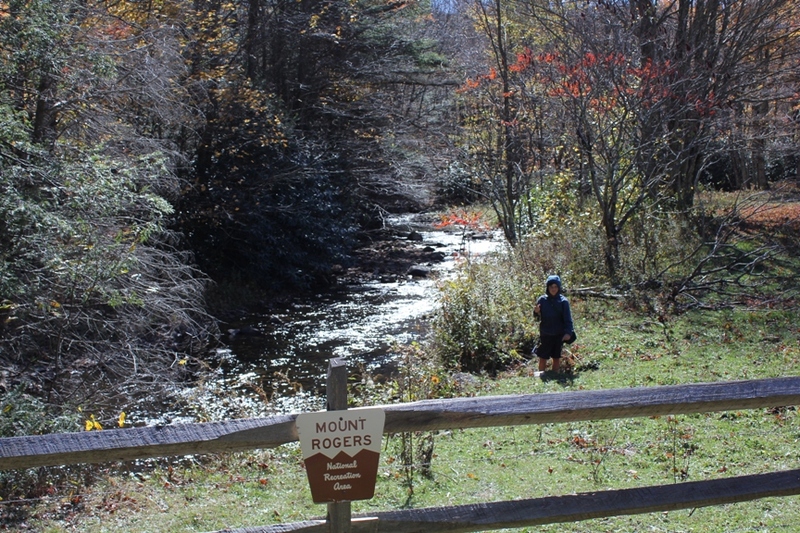 However, the flow of the creek is variable as it is dependent on runoff from Mount Rogers. The views up and down the valley are Western-like. 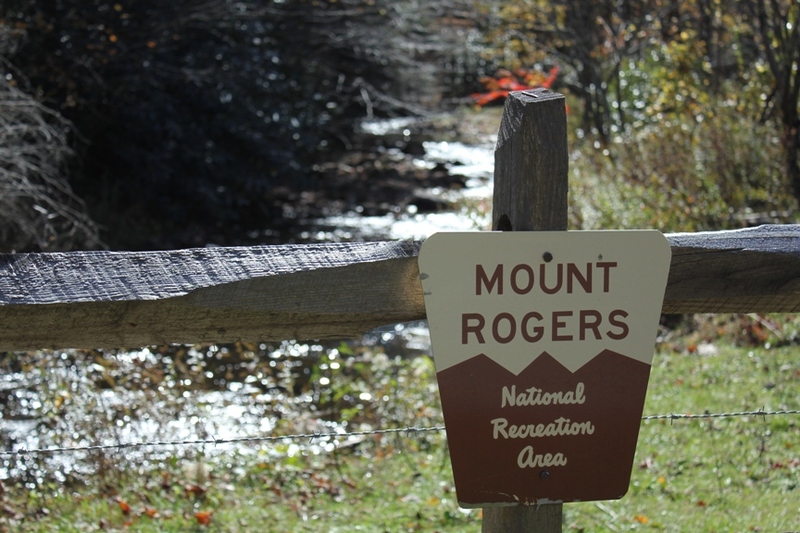 In fact, much of the Mount Rogers area reminds many people, including me, of the West. It’s like a little slice of the West dropped into Southwest Virginia. 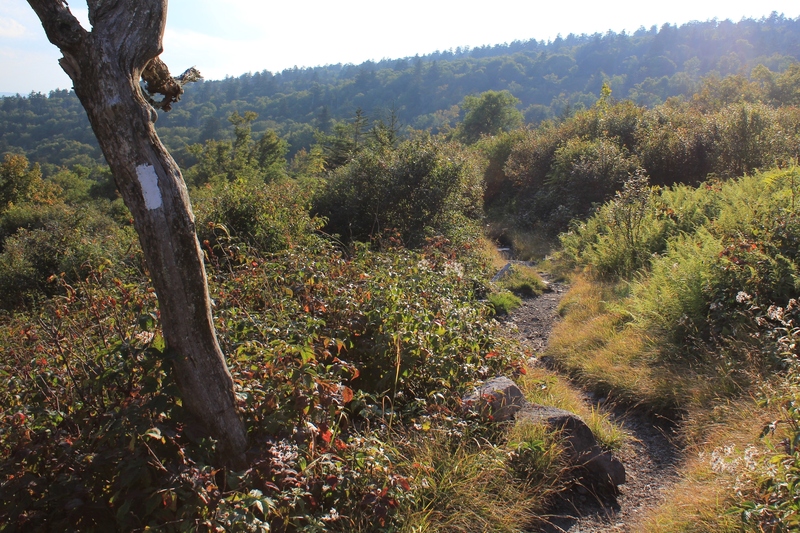 The large meadows along upper Fox Creek provide many starting points for short hikes. 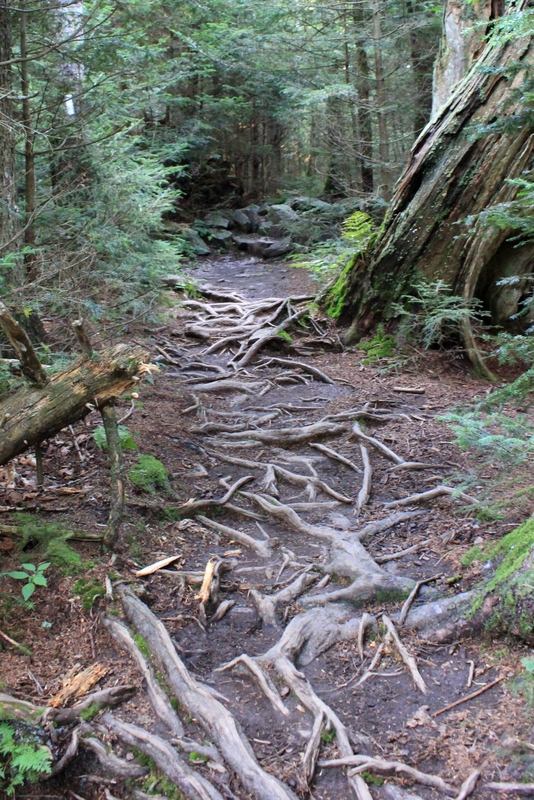 There are also numerous places to begin longer hikes up Mount Rogers or Iron Mountain. Yesterday morning, November 17, we had the first snowfall in Abingdon. It started after I was already at work, so I didn’t get any pictures of it. It only snowed for a couple of hours; it was not a particularly heavy snow, and the ground was too warm for any of it to accumulate. Unlike many folks, I always enjoy the first snowfall in town, as it means we’re in the season where we’ll see more of it in the mountains as winter approaches. However, the snow yesterday wasn’t the first this fall in Southwest Virginia. In the eastern end of Washington County we had noticeable accumlation twice in October. The first heavy dusting occurred on Saturday, October 1, 2011. 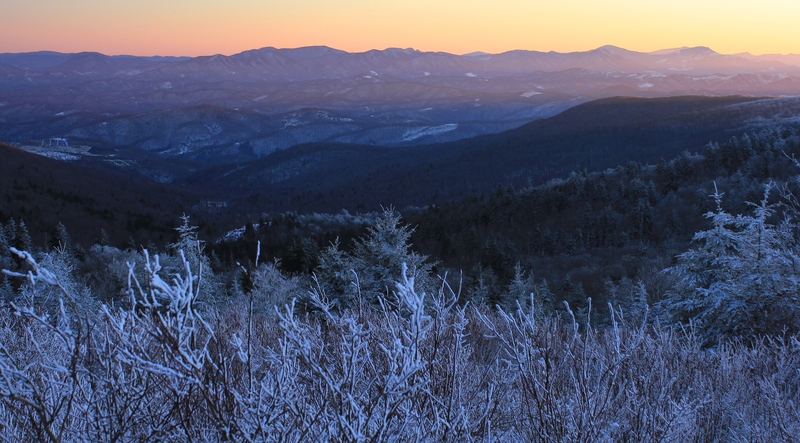 When we were camping at Grindstone last month (see my previous article), the campground host told me that it snowed all Saturday that first weekend of October, and there was significant accumulation all over the north side of Mount Rogers. By the time I took the photo above, the weekend storm cleared out, the sun warmed the day back into the upper 50s°, and most of the snow had melted off of the mountains. 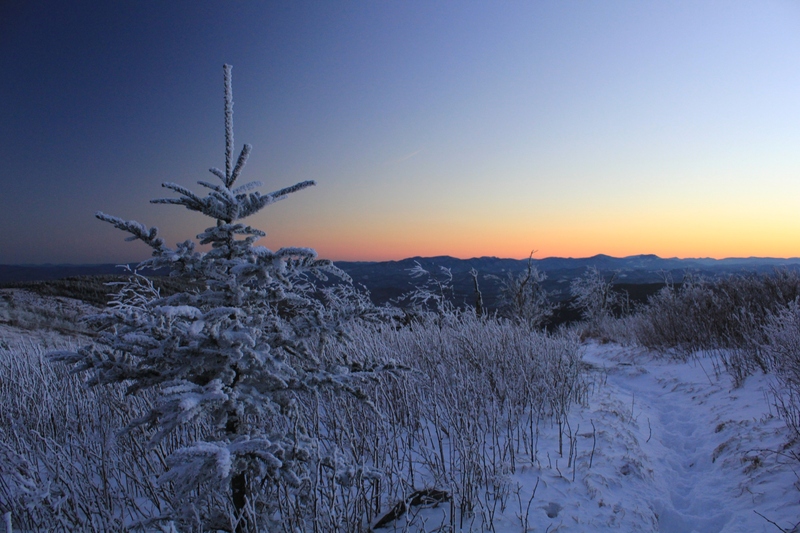 You can still see some remnants on the summit of Mount Rogers (on the left side of the photo). The scene earlier in the day was more dramatic; it is a strange contrast to see snow on the mountains behind the green, deciduous trees in the valley before they’ve changed into their fall colors. 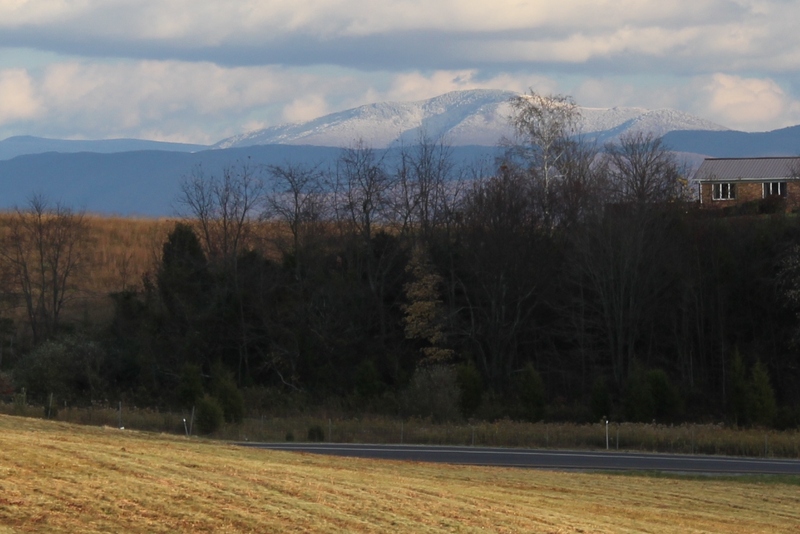 The last accumulation of snow in the Virginia High Country this past Spring was May 5, 2011 (see photo here). 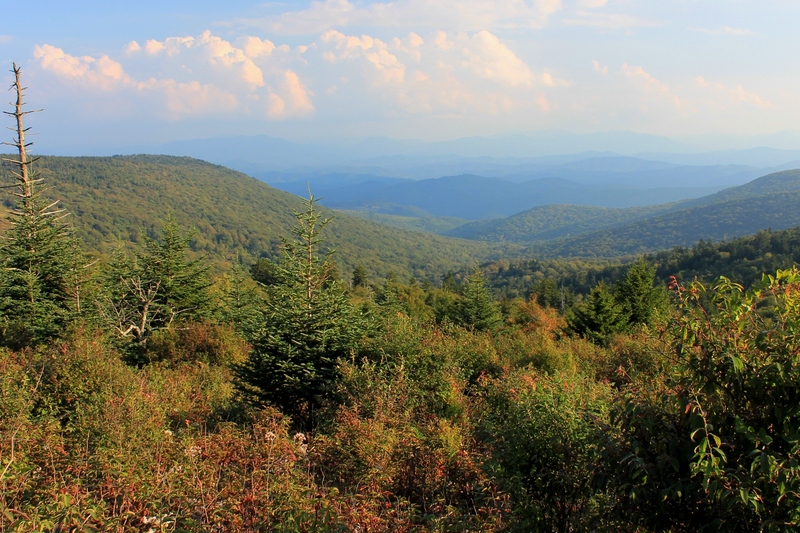 Therefore, even with the relatively mild fall, those who love snow only had to go four months this year–June, July, August and September–before the sight for sore eyes of a white-encrusted mountain top reappeared in Southwest Virginia. As the sun reflects the autumnal hues of falling foliage, we no longer take the endless days of summer for granted. Our appreciation of the sunlight grows as each day becomes shorter. The sun bursts through golden foliage in the Mount Rogers National Recreation Area. Like most natural resources, our conscious awareness of the sun increases in proportion to its scarcity. A whole sunny week is a nice thing. On the other hand, a bright, sunny day following a gloomy, rainy week−now that, my friend, is absolutely glorious! The warmth of the autumn sun is more palpable in some way, too, and parallels the warm colors of the season. I find myself consciously glancing up to catch the sun’s rays more often in autumn, sometimes as they are cast through the trees. 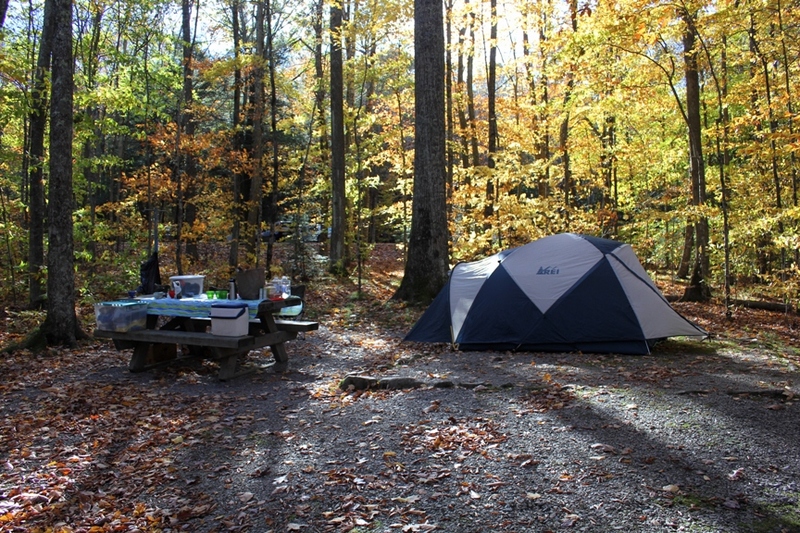 This past October 15-17 we camped at Grindstone Campground in the Mount Rogers National Recreation Area. This is one of our favorite campsites, and it is somewhat of a tradition that we come here at least once almost every fall. 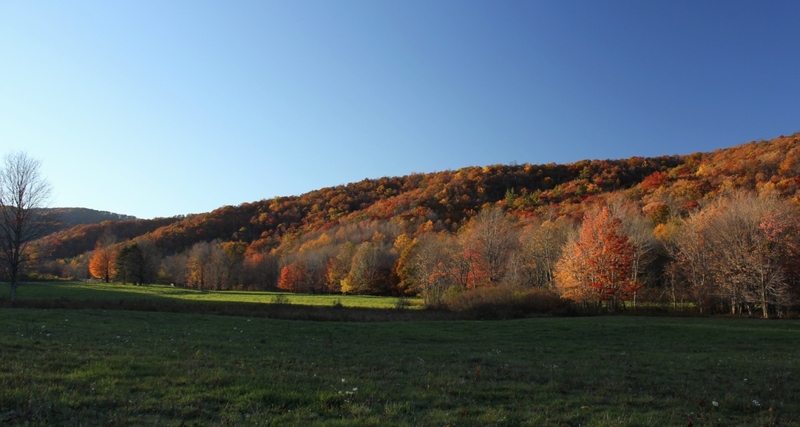 The elevation, about 3300′, and the climate here usher in a change in the foliage that is usually a few weeks ahead of the change in the towns and cities of the region. We enjoyed fine fall colors, with the brilliant early reds and yellows across the mountains giving way to the finer and more subtle burgundies and golds of late fall. These are the archetypical colors of Southwest Virginia in autumn. Our campsite was flooded with color each morning and afternoon. The long shadows added texture to the imagery. 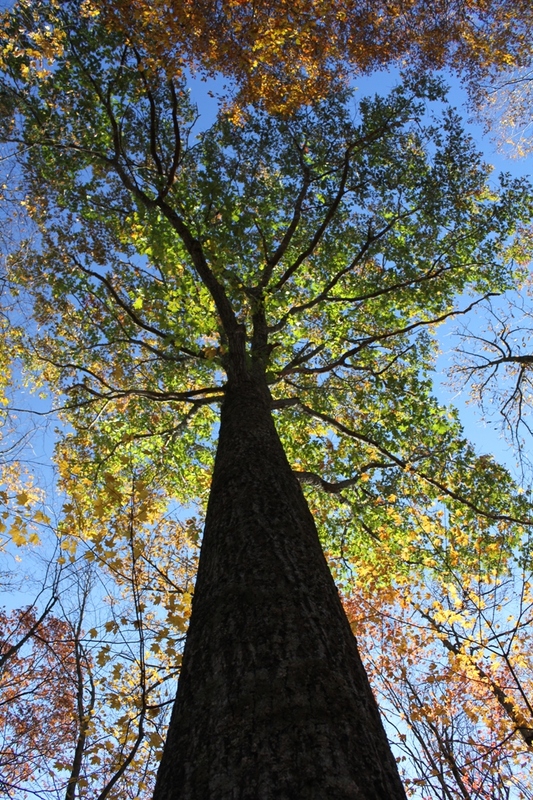 One tall oak, larger than all the others, stood sentinel over our tent, leaves and branches rustling as the wind blew through the campsite all weekend. The autumn sun and its accoutrements−the colors, the shadows, the warm daylight and accompanying cool, crisp nights−these things make fall my favorite season for camping. Bigfoot has been sighted in Southwest Virginia. Apparently often. Usually associated with the mountains in the Pacific Northwest, there have been encounters with bigfoot, or sasquatch, all across this country. Earlier last month, I was finishing a hike with a client when we saw an 8′ tall, fur-covered, man-like creature stop on the trail about 100′ in front of us. Standing but slightly hunched, it turned its head slowly and looked back at us, barred its teeth, and then quickly lumbered away down the hill out of sight. Neither of us had our cameras ready. It happened so fast we were not able to get a photograph of the creature. Dumbfounded, shocked, and in fear, we just stared down the trail and then back at one another. Actually, that’s not what really happened. So our conversation began. We talked for a while, and we learned he was one of the producers of Finding Bigfoot. After a short introduction by the show’s cast, the floor was open for local residents to tell their best Bigfoot stories on camera. Most of the witnesses’ stories had the common theme of spotting an extremely tall, broad-shouldered figure while hunting in the woods. One of the hunters was a man from Piney Flats, Tenn., who told a detailed story about how a large, dark figure with long, matted hair walked up to him, looked at him for a moment, then walked away in a zigzag motion. “With my hand up to heaven I know what I saw,” the man said after he told his story. A teenager from Saltville told a story about how she saw the familiar dark figure at the top of a hill outside her home, and soon after she made eye contact with it she was hit by a rock that left a sizeable bruise on her right leg. She even brought in a drawing of the creature to show to the cast. The phenomenon of the fascination with bigfoot is itself fascinating. Like other paranormal phenomenons, such as UFOs, opinions on the existence of bigfoot are polarized. Either you believe they exist, or you think those who do are freaks. 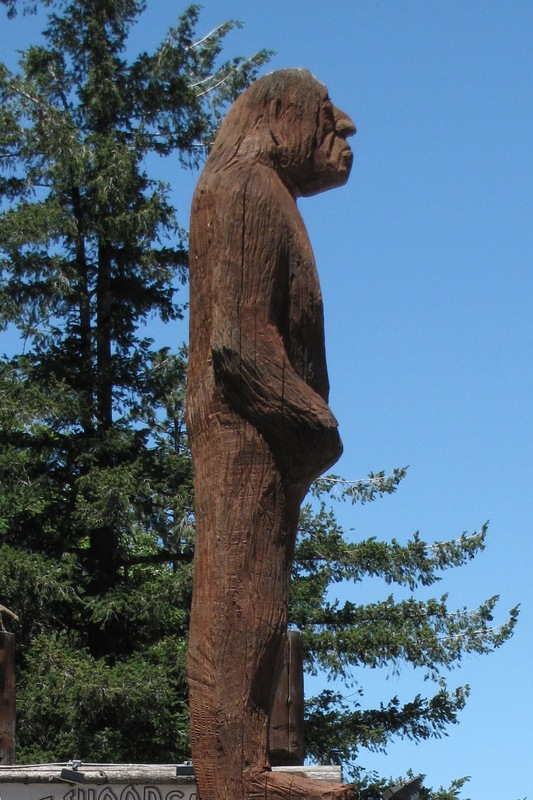 Those who believe in bigfoot argue that bigfoot’s existence without definitive human knowledge is not that far-fetched: There are other phenomena−far larger phenomena−that have existed without human knowledge through the ages. For example, until the last 10-15 years, many of the world’s tallest waterfalls remained unknown to humankind (the 3rd, 5th, and 16th tallest waterfalls were only recently discovered). If such large geographical formations could remain hidden, is it not possible that an intelligent humanoid could covertly exist in remote areas of the country? The great climber, Reinhold Messner, spent several seasons in the Himalaya and had an encounter with the Yeti. Messner wrote a book about it, My Quest for the Yeti. Messner ultimately concluded that the Himalyan Yeti was most likely a bear. 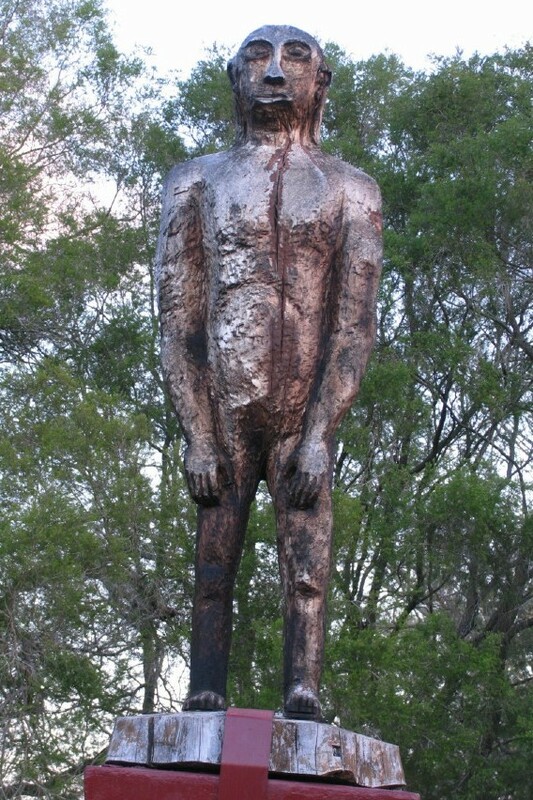 Perhaps most, if not all, human encounters with bigfoot could be explained in some similar fashion−misconceptions about what people saw or thought they saw. One website purports to map all of the confirmed bigfoot encounters in the United States. From my review of the maps, there are more bigfoot sightings in the Eastern United States than in the West. There are numerous encounters near New York City. Which brings us to the penultimate question in this article. Hypothetically, if there are bigfoot in Southwest Virginia, where would they most likely be? 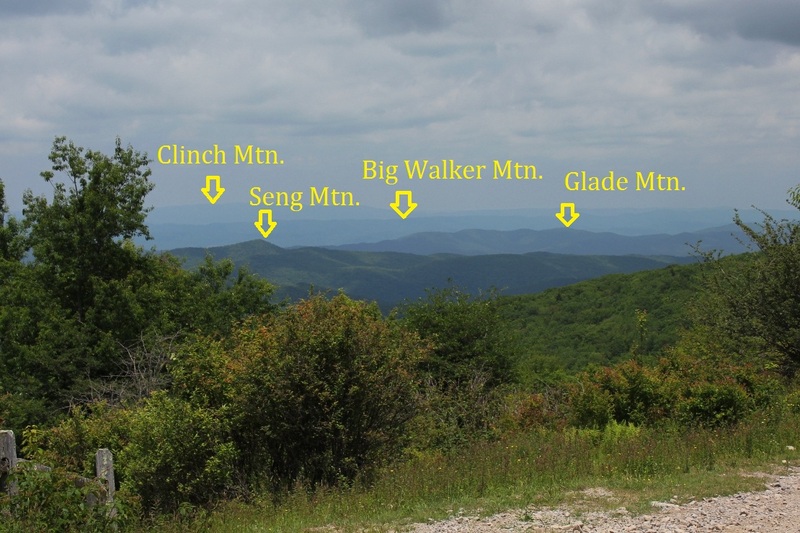 My guess would be up on Clinch Mountain, in the Mount Rogers National Recreational Area, or somewhere near the Virginia-Kentucky state line near Breaks Interstate Park. These are the most rugged areas of this part of the state, where the squatch could reside with fairly large ranging areas and yet hide from humans. So, is there a squatch in these Southwest Virginia woods? I can’t wait to hear the testimonials on the TV show and find out. And next time you are in the outdoors, be extra aware. Oh yes, keep your cameras ready, too.